The ADSL Hardwired filter is designed to allow the connection of hardwired autodiallers to broadband enabled lines. 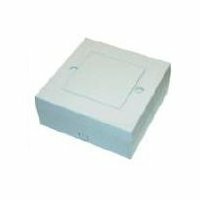 The unit consists of a surface mountable box that contains a standard SIN 346 compliant ADSL filter circuit which provides the correct filtering of signals to allow simultaneous use of both the autodialler and broadband services. Connections to the filter unit are made using industry standard screw terminals.